From Elati village to Igoumenitsa At the afternoon I left from my village Elati with my parents towards to Chaliki village the last one of Trikala region and we reach Metsovo. Archodis and Apostolis were start their travel from Komotini and Kavala respectively. At 19:00 they were in Metsovo, they pick me and continue together driving to Igoumenitsa port (21:00). We wait there more than 2 hours in order to enter into the boat Minoan Olympus Palace, which was arrived delay. Into the boat we meet the rest member of the team which were board from Patras port. The team was consisted by George (climbing instructor) and 6 senior climbing instructors. At 14:00 at the afternoon we reach Ancona were it was too hot. All our cars left together, our destination was Chamonix in France. It was a nice trip about 660 Km, We pass through Mont Blanc tunnel 12Km long and finally reach Chamonix at 23:00 at night. 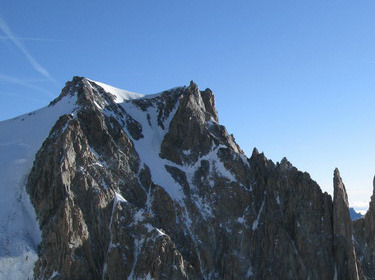 We camp in the camping L'lle des Barrats which is located very close to Chamonix central and in a silent area. The climbing school went to the glacier for a rescue course while I did a short walk in Chamonix in the morning. Later on I hike from Chamonix to the peak Planplaz with 2000 meters altitude, located south of Chamonix. It takes me 3 hours to walk up and down to Planplaz peak from where I had very nice glimpses of Mont Blanc group. A teleferik under construction was leading to the peak Planplaz stating from Chamonix. The path starts from the center, first it is a small steep dirty road, and after a easy walk path guides to the summit Planplaz. The total ascent to Planplaz from Chamonix is about 1000 meters. At the afternoon when we had dinner i met my friend Aris, Dimitris and Alex. They were in Chamonix since a week ago, and I decide to climbing with them next day. It was still dark at 5:30 when I arrive in the cable car which is going to Aiguille du Midi. I met my friends Ari, Dimitri and Alex. We went with the first cabin at 6:10. It is nice experience to visit Aiguille du Midi using the cable car, and having a nice view from the surrounds peaks. Using the cable car is the only easy way to reach the glacier Valle Blance. At 7:00 was begin roped together from the tunnel of Midi and following the narrow snow ridge which is guiding to Valle Blanc or Glacier du Geant. We cross the glacier a slow tempo passing from Col du Midi 3532m the lower part of the glacier and we start to climbing up. The south slopes of Mont Blanc du Tacul contans many seracs and crevasses. The slope of the south face of Tacul in not more than 35 degrees. There were many climbers on the route, they probably overnight last night in Cosmique refuge. The weather was not good, it was too foggy. We follow the footprints of the previous climbers and we reach the rocky summit. The last part needs a mixed climbing for a few meters. We reach the summit of Mont Blanc du Tacul 4248 meters at 11:00 in the morning. I could not see farther than 10 meters while a strong cold wind enforce us to go back. We follow the same rote back to Aiguille du Midi (16:00), from where we took the cable car and went back to Chamonix (17:00) where a met my friends in the camping. The climbing school went to Aigiulle du Midi and made two rock climbing routes. I left alone from camping at 7:15 in the morning with direction to village les Houches at 995 meters (8:30). Form the village I take the path called Mont Blanc which is lading to Col de Voza 1653m (10:00). I follow the ridge on the left I pass from Bellevue to la Chalette and Ι continue the path parallel with the railways. I climb the summit :Lachat with 2115 meters altitude (11:00) from where there is very nice panoramic views of Chamonix valley and the peak Midi and Tacul. I continue the ridge to Col du Mt Lachat 2077 meters where is the one before the last stop of the train. From the col I took the direct path to village les Houches which is passing through the beautiful forest "Baraque Forestiere des Arandellys". The path was in very good condition and i was of my best that have ever walk. At 12:30 I reach les Houches village and at13:40 I was back to Chamonix. It was raining and the mountains was covered by fog. We remain in Chamonix for shopping and resting in the camping, planning the last climbing route. Before noon we left from the camping and we drive to the Italian side of the mountain to Courmayeur. We stay to drink a coffee in Courmayuer and using the cable car we went to Torino refuge at 3371 meters altitude. The refuge had panoramic view to Courmayuer valley and specially to imposing "Dent du Geant", the mythical summit with 4013 meters altitude. We had dinner and we sleep early to be rested for the next day's route. We wake up at 2:00 after midnight and after our breakfast we left at 3:00 to climb the route Kuffner. I was foggy and too dark. First we descent in to Valle Blanche and after gradualy start to ascent the valley between the peaks Arete de la Breva and le Grand Capucin. We move left and we take the couluar which is leading to Arete de la Breva reaching Col de la Fourche. First we pass the rime roped together and we continue moving parallel. The couluar was with icy snow and ice with steepness which is now exceed the 60 degrees. Left on the ridge there is a small biwy hut "Biv. de la Fourche ou A Borgna". When we reach the ridge we continue climb the beautiful ridge on the right. Then the sky starts to be red and we had a very nice sunrise. The route was 600 meters long with difficulty D and with many rock passes grated as IV. After many hours of continuous climbing we reach the col between the peaks Maudit and Tacul. From there we continue the ridge on the left and we traverse Mont Maudit 4468 meters (11:00) which finally climbed from the north face. We return back from the classic route which is going to Mont Blanc. 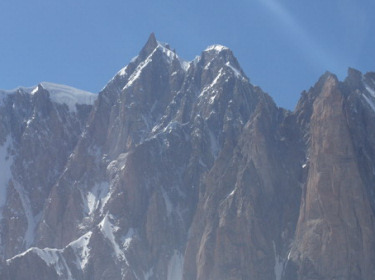 We pass from the col between Tacul and Maudit, and we traverse Tacul summit. We take the classic route to Aiguille du Midi where we arrive at 14:00. Using the cable car Mont Blanc Panorama we return back to Torino refuge. Archodis, Apostolis and me pick up our equipments and with the cable car we return to Courmayuer. 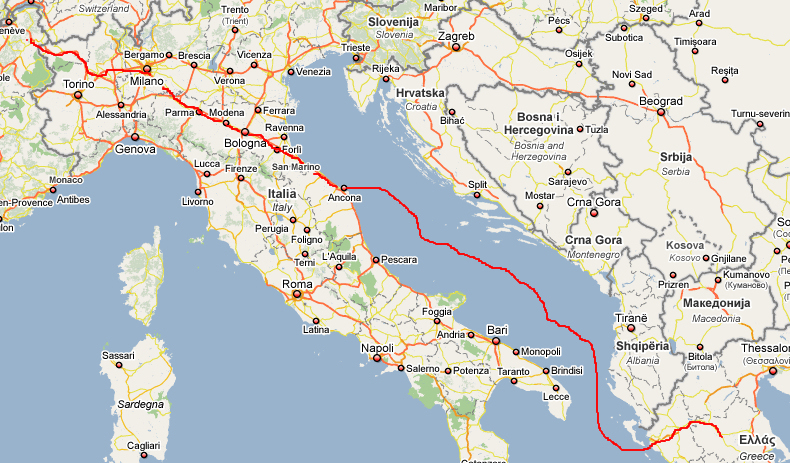 We pack our stuff and after a short break in Courmayuer we drive on highway to Milano. Somewhere on the middle we stop in a parking where we pass the night. In the morning we last driving to Ancona. It was full of traffic the highway from Milano to Ancona and we had to stop many times on the way. It takes many hours to reach Ancona and finally we were only 1 hour before the ferry leave. At 17:00 we enter into the ferry and later we depart to Igoumenitsa. At the same ferry a friend of a visitor of our hotel in Elati travel was also. He was from Georgia and driving to Georgia passing from my village. Such, we drive from Igoumenitsa (10:00) back to my village (Elati) together. Such, at the afternoon I was back to Elati.